As with fish sauce, no true Thai kitchen is quite complete without shrimp paste – kapi (also transliterated at gkapbi or gabi) – the dense, dark purplish and greyish brown, fermented shrimp paste with an intensely pungent odor, which most unaccustomed westerners find overpowering and even repulsive. 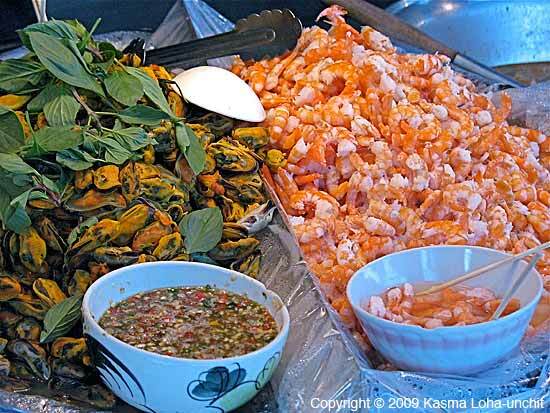 In one form or another, kapi makes its mark in just about every Thai meal, and especially among villagers in the Thai countryside, there is hardly one that would be complete without some kind of nahm prik (hot and spicy dipping sauces for vegetables and fish) in which this shrimpy paste simply shines. A favorite nahm prik is named after it (nahm prik kapi) since it is the primary ingredient; accompanying pan-fried, local gulf mackerel (bplah too) and raw, blanched and egg-dipped-and-fried vegetables, this humble food of peasant origins undisputedly constitutes one of Thailand’s favorite foods – popular among both poor and rich. 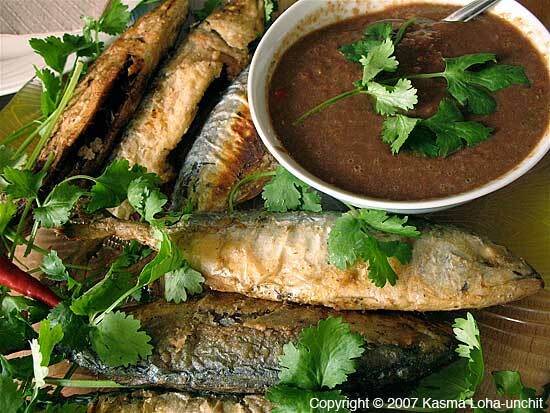 In fact, when one of Thailand’s beauties won the Miss Universe title, her answer to the question “What’s your favorite food?” delighted Thais around the country when she without hesitation named this combination of nahm prik, mackerel and vegetables (nahm prik bplah too). 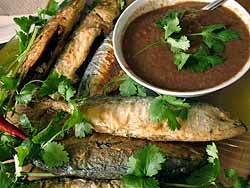 Like fish sauce, kapi is rich in protein, B vitamins, calcium and iodine. 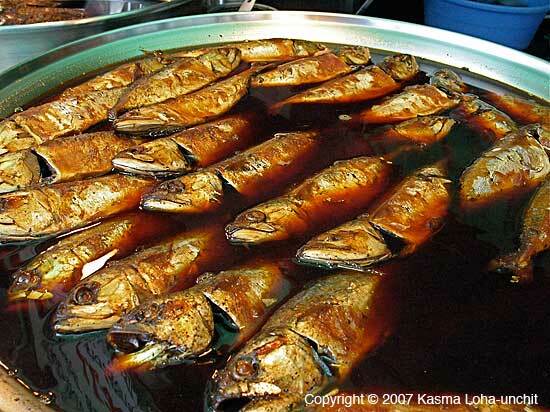 Also like fish sauce, not all kapi is the same and can vary quite a bit in color, aroma and quality. 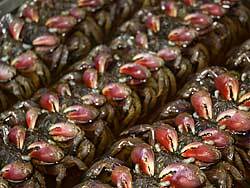 Though much of it is rather smelly, reminding one of rotting shrimp, the fresher and higher grades can actually have a pleasant, albeit strong, aroma. Some of the best can be found in the bustling markets and roadside stalls of several seaside towns known for their seafood products; and each chance I find to vacation on the southern coast back home, I can’t resist picking up a supply for my kitchen. When I run short, I favor a brand imported into America called Klong Kohn; Tra Chang (also of fish sauce fame) is also good. Both have a distinct smoky aroma, reminiscent of roasted shrimp, and when combined with other robust Thai ingredients, a little bit of the concentrated paste goes a long way to adding a whole lot of delicious shrimpy flavor. 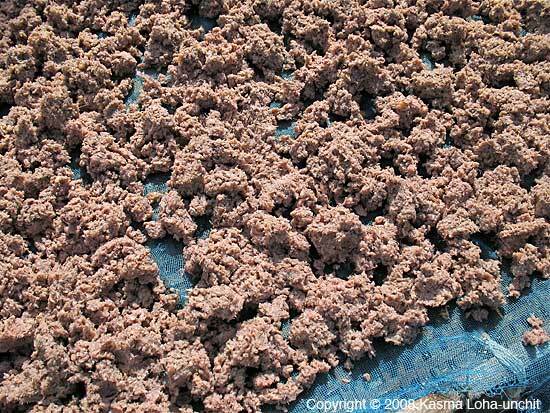 Unlike fish sauce, shrimp paste is still mostly made by fishing families in villages along the coast, then sold to market vendors for resale to consumers, or to middlemen and distributors, who package them into containers with their brand names on them. Because each area has its own way of making shrimp paste, the product collected from families and villages in the same vicinity tends to share similar qualities. 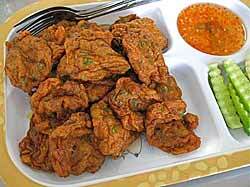 Kapi, therefore, becomes known by the province or village from where it comes. 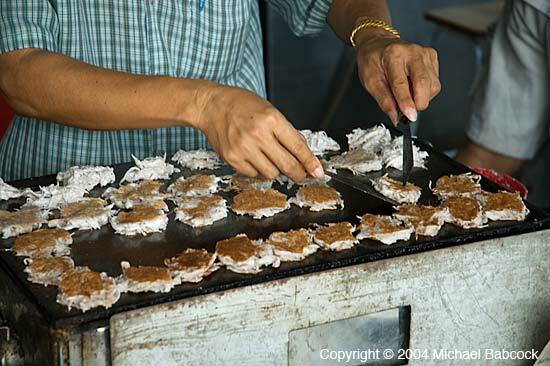 My husband and I once visited a small village known for the quality of its kapi, made from miniscule white shrimp, known as keuy, smaller even than a housefly. 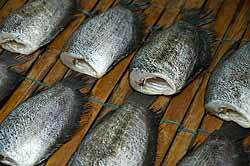 Fishing boats leave for sea in the morning and return in late afternoon with their catch. The sleepy village suddenly awakens, as the shrimp are unloaded, rinsed, laid out to drain before salting (approximately 1 cup sea salt to two pounds of shrimp), then filled into earthenware jars overnight. The next morning, they are spread out on plastic or fiberglass mats on the ground or on platforms next to the fishermen’s simple wooden homes to dry in the hot tropical sun. Late in the day, they are gathered and re-stored in the jars for the night, to be laid out again the next day when the sun burns hot. This goes on for three or more days, until the shrimp disintegrate and dry from pink to a dark purplish brown. 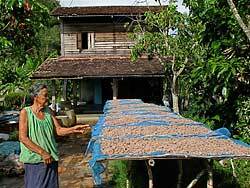 When the shrimp are no longer recognizable and completely turned into dense paste, the kapi is ready for use and is returned to the earthen jars until an agent comes by to collect it. The shrimp paste gathered from all the families in the village is mounded into enormous, colorful plastic tubs, each weighing several hundred kilograms when filled. If properly dried, the paste can keep for several months without refrigeration. 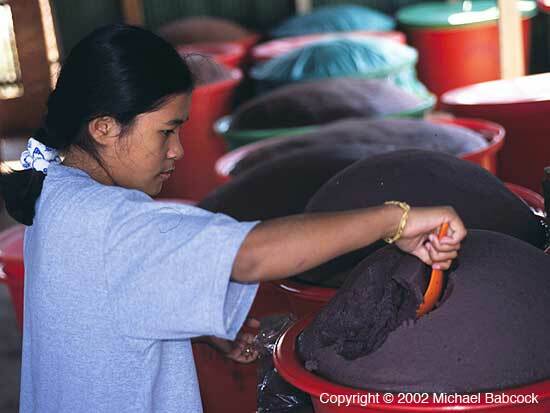 To make kapi from larger shrimp, the shrimp are allowed to ferment for a few days in the earthen jars to soften their shells before placing out to dry in the sun. The drying takes longer, the number of days or weeks dependent on the size of the shrimp. 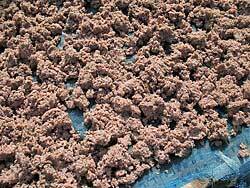 During the drying stage, partially decomposed shrimp are periodically put through a grinder, or pounded in a large mortar, then placed out to dry further until they become a fine paste and develop the dark finished color. 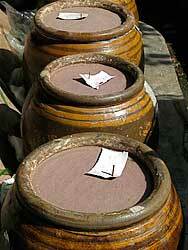 The agent keeps the different grades made from different kinds of shrimp in separate, color-coded tubs. Even though we were surrounded by huge mounds of paste, several tons in all, we were amazed how we barely noticed the stench of fermenting shrimp, unless we put our noses right up close to the paste. That day, we bought a few kilograms of the best grade from the village to give as gifts to family and friends for a mere pittance; stalls along the major highway nearby sell the same grade for double the price; and by the time it makes its way into Bangkok, the price would have climbed a lot more. 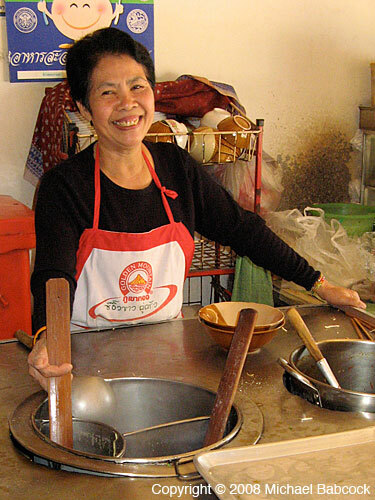 Similar pastes made from shrimp are also used in the cooking of southern China and other Southeast Asian countries. These can vary from light pinkish grey and very moist, fluid-like sauces in jars to dark chocolate-brown, firmly compressed blocks. 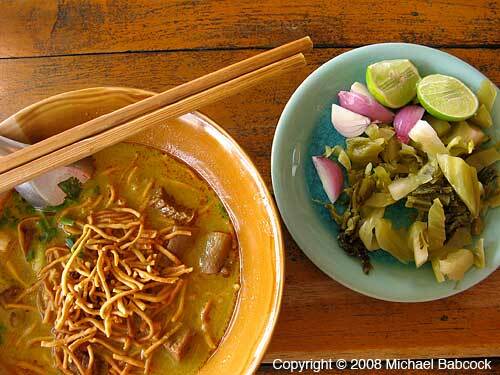 The kind used for Thai cooking leans toward the latter. 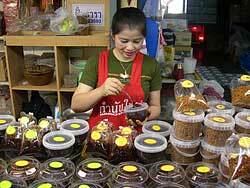 Since other Asian cultures use shrimp paste differently in their cooking and prefer different strengths, it is best to purchase a product from Thailand for use in Thai dishes. 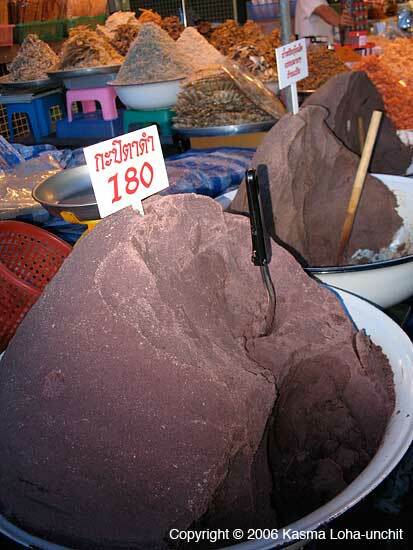 Kapi from Thailand usually comes packaged in small plastic containers, labeled as “shrimp paste” and listing shrimp and salt as the only two ingredients. Most brands cover the top of the paste with a layer of wax to seal in freshness; remove before using. When refrigerated after opening, it will keep indefinitely. Because different batches vary in saltiness and shrimpiness, make adjustments as necessary in the recipes that call for it. Written by Kasma Loha-unchit, January 2010. 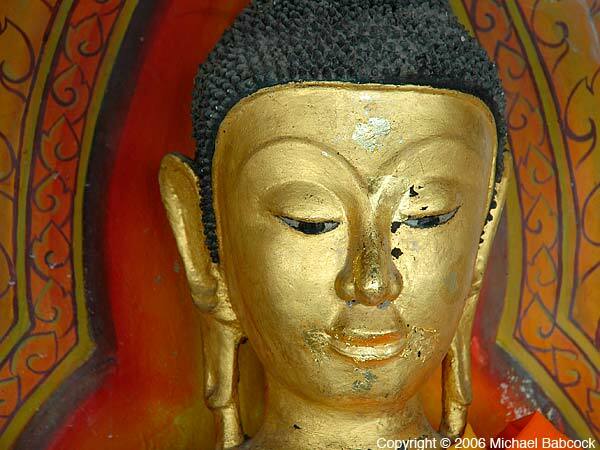 What did it mean that he [Kondanya, an early disciple of the Buddha] had seen the Dharma? He had attained knowledge and vision that all things arise in the beginning, change in the middle, and pass away in the end. 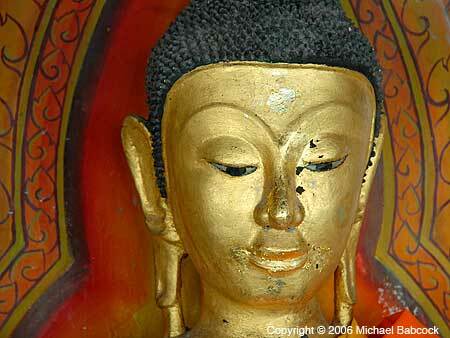 “All things” means all phenomena of body and mind, and these characteristics apply to all of them without exception. – Ajahn Chah, in Being Dharma, p. 155. From: Being Dharma: The Essence of the Buddha’s Teachings. Ajahn Chah, Translated by Paul Breiter. Shambala, Boston & London, 2001. I like this photo because it reminds me of Thailand parking lots and traffic. In both parking and driving, Thai people are able to fit their cars into spaces that you would swear were just too small. To the left are cars parked at 90 degrees to the front of the condominium units; these are assigned spaces to residents. The other cars, starting with the blue cab in front, are parked in front of the other cars; the drivers lock the car but they leave the car in neutral so it can be moved back and forth and the 90 degree parked cars can get in and out. You see this in parking lots everywhere; parking space is at a premium. 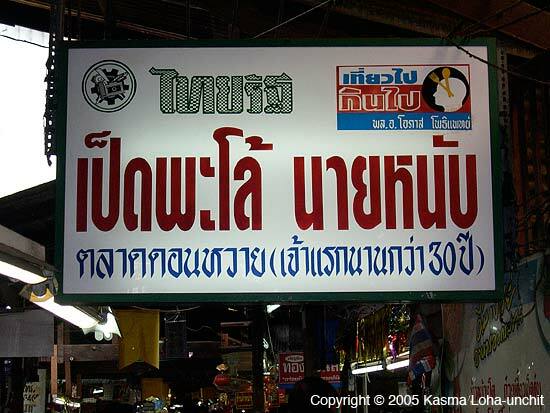 One of our favorite markets in Thailand is Talat Don Wai – Don Wai Market – in in the Sam Phran district of Nakhon Pathom on the banks of the Nakhon Chaisi river. 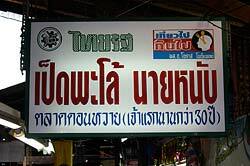 The market remains largely undiscovered by westerners, although it’s a popular market for Thai tourists; usually when we visit at least one Thai tour group comes through. 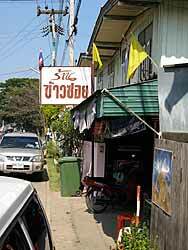 It’s It’s actually very close to Bangkok – about a 30 to 40 minute drive for us, most of the time. I have no idea how to get there by public transportation, although a Bangkok Post article says that there’s a BTS station slated for Bang Khae, apparently quite close. It’s associated with a temple, I believe of the same name, and located directly next to it, right on the river. We visit at least once every year; we always bring Kasma’s mom along (which means I don’t get to take too many pictures, as I wheel her mom along in a wheel chair). 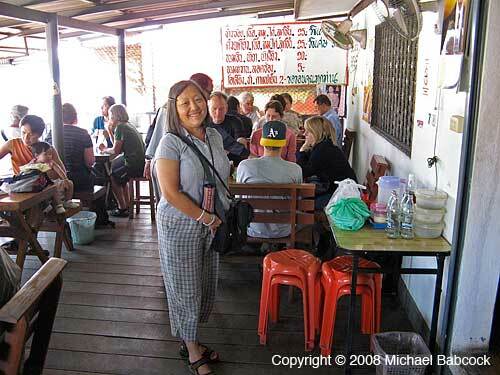 I like that everything here is geared for Thai people; I’ve seldom seen another westerner here. The market is noteworthy for a number of things. There’s a very good selection of dried fish and all kinds of prepared seafood, both fish, crustacean and mollusk: one of these consists of smaller, whole fish floating in a dark sauce called tom khem. You’ll see a lot of duck here; from roast duck to a Chinese-style duck stew called ped phalo. 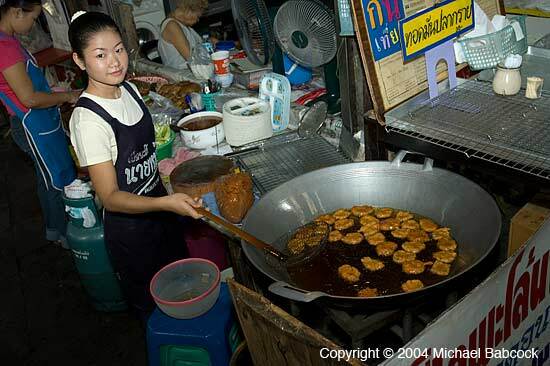 On our visits we always eat at a restaurant on a deck by the river that sells great duck noodles; and we always get a serving of the fried fish cakes (tawd man) that’s found sizzling in the wok on the entryway in. As you enter the market from the parking lot, you go through a section with fresh produce, some very good-looking fresh fruit. We’ve bought pomelo (som-oh) here as well as jack-fruit. You then enter a section that has dried fish, prepared food and vendors making various Thai kanom (snacks) right there. 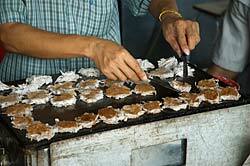 We always get some delectable kanom paeng jee (grilled coconut cakes). 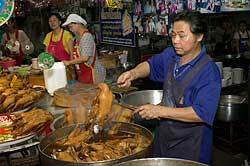 There’s a vendor in this section that has great bplah som (fermented fish) that we take home and fry up crispy. 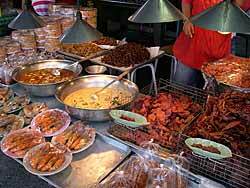 The next section has lots of dried fruits, snacks of various kinds, coconuts of various kinds, including some species that are considered medicinal, and also a stall with lots (and I do mean LOTS) of stewed ducks. One year we came here around New Year’s and even with the huge pots they have, there were very few ducks left. At the end of this section there’s the path to the restaurant we like – when we’ve gone there’s always been a young woman out front frying up the fish cakes. I won’t say much more: I’ll let some photographs from our visits here give some sense of the color and variety, although there’s so much more to see than I can include here.The best thing to do is to go there yourself. Make sure you’re hungry because you will definitely be tempted! Be sure to click on the pictures to see a larger version. 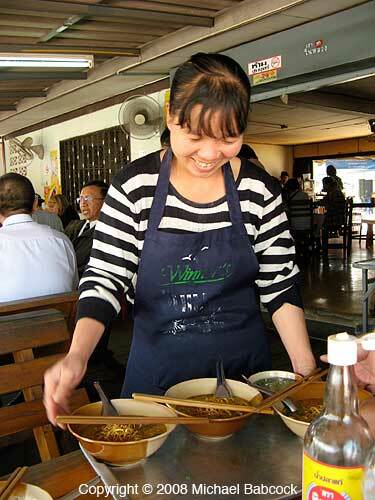 These pictures show some of the delectable already-cooked food available at Don Wai. You never really need to cook in Thailand – there’s always something delicious available. 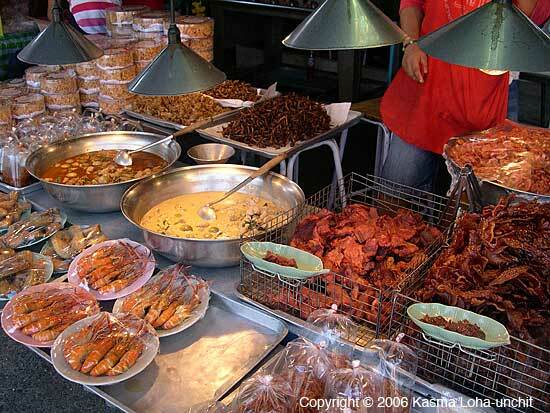 Seafood is one of the highlights of the market. 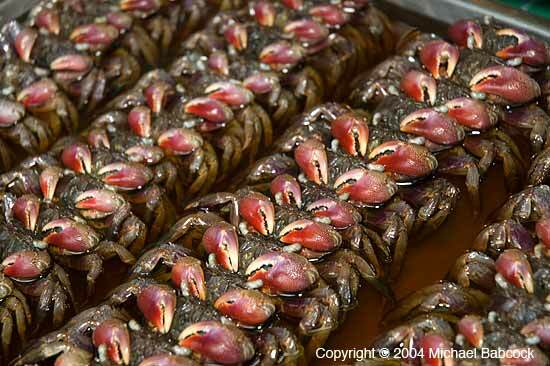 On the left are some very fresh crabs. 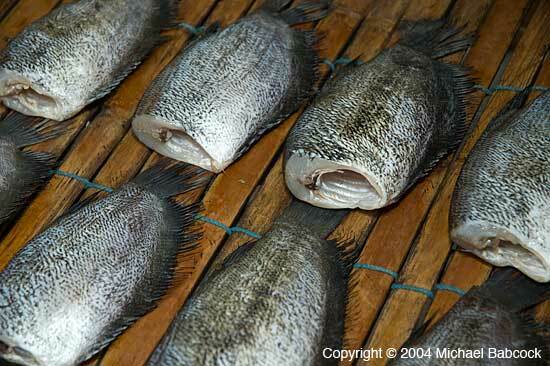 The left picture is of a ready-to-eat fish called tom khem. There’s a well-kept secret in Thai cooking – nahm prik; on the left is a woman selling these pre-made chilli pastes (both wet and dry) that can transform simple ingredients into a one-dish meal. 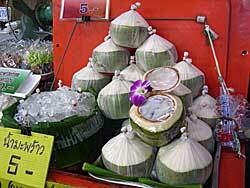 And no Thai market is complete without young coconut, a refreshing drink at all times. 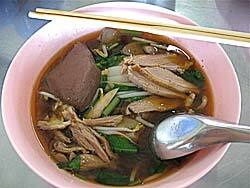 Whenever we visit Don Wai market we eat duck noodles at this riverside restaurant. You’ll recognize it by the sign (it’s to the right, riverside, as you stroll the aisles) and also by the huge wok out front, usually with someone frying up delicious fish cakes. These photos show what we often have for lunch at the riverside restaurant. There are a wide variety of sweets (kanom wahn) available at Don Wai, as at all Thai markets. 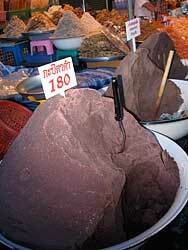 (See Michael’s blog on Thai sweet snacks.) 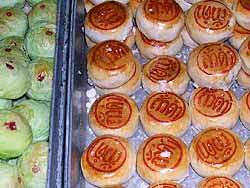 They range from Thai coconut treats to Chinese sweets such as these. 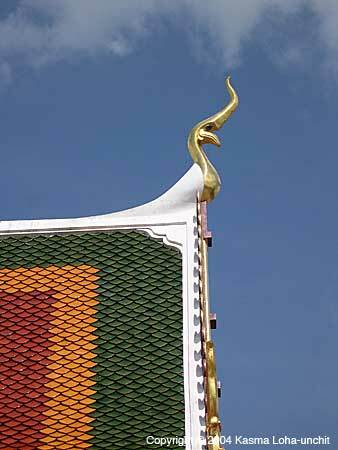 This should be a familiar sight to anyone who’s travelled in Thailand and visited a temple: the edge of the tiled roof, protected by a Naga. I particularly love the colored tiles and molding set off against the very blue sky. 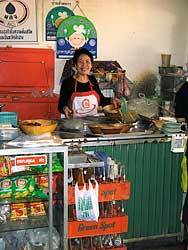 The shop is found on the main road in between the beautiful wooden Lanna temple, Wat Phra That Lampang Luang, and the town of Lampang itself. Look for the sign (it’s the first image in the blog, to the upper left). 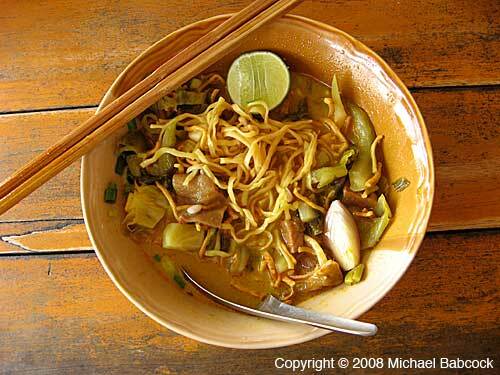 Our Wednesday photo of Kao Soi from one of Kasma’s classes. 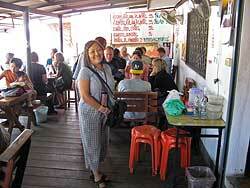 Kasma stops at the shop on her two trips that visit Northern Thailand. 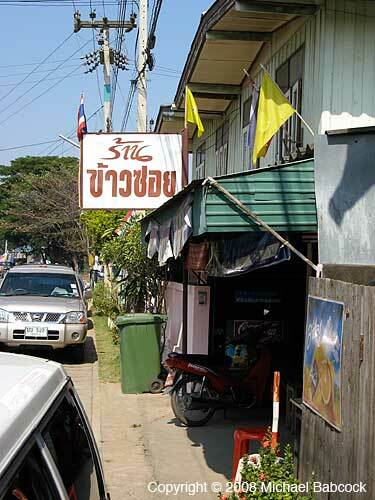 It’s typical of most noodle shops in that they specialize in one type of noodle, in this case the curried noodles of Northern Thailand. You can order with beef, chicken or pork. When you come in, you’ll see where they assemble the noodles at the front of the shop. It’s kind of fun to watch how they do it: it’s a very speedy operation! The best place to eat is in the back of the shop, outside, with a nice view of the river. 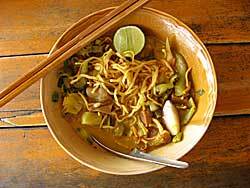 There are many things that I like about kao soi. First, the curry sauce tastes divine. 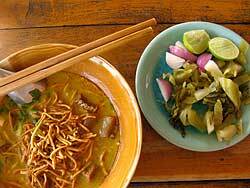 Second, it’s loaded with different textures, from the crunchy fried noodles to the fresh shallots pickled cabbage that you add yourself. Finally, there’s the addition of roasted chilli oil, which adds a divine, spicy flavor and gives the dish a delightful kick that convinces you that there is something in red chillies that truly does get the endorphins flowing! 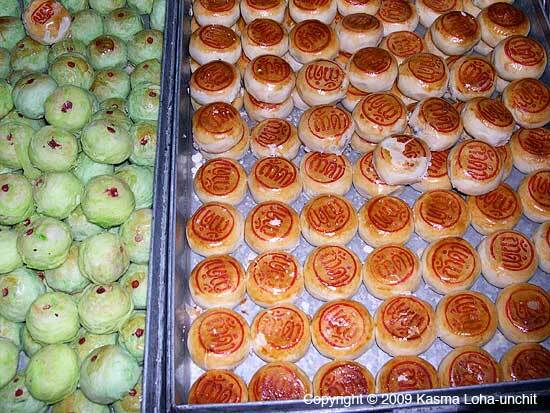 It’s also a fun food to eat, participatory. You get to add your own vegetables and chilli oil and mix together. Do be careful adding the fiery, hot chilli oil – although it’s very delicious the noodles start out with a fair amount of heat; one at least one occasion I regretted the addition of so much extra spice! 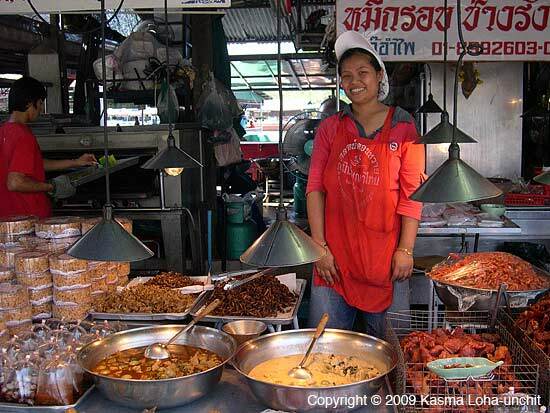 You are currently browsing the Thai Food and Travel Blog blog archives for January, 2010.